MONTREAL — Along Montreal's Saint-Laurent Boulevard are rows of greystone and red-bricked buildings dating from the early 20th century, many of which used to house businesses owned by first-generation Jewish immigrants who didn't speak French very well. Steve Schreter's clothing store — opened by a relative in 1928 — is one of the few from that time period remaining on the city's famous strip. Schreter and his family, particularly the youngest among them, can all speak French, Quebec's only official language. 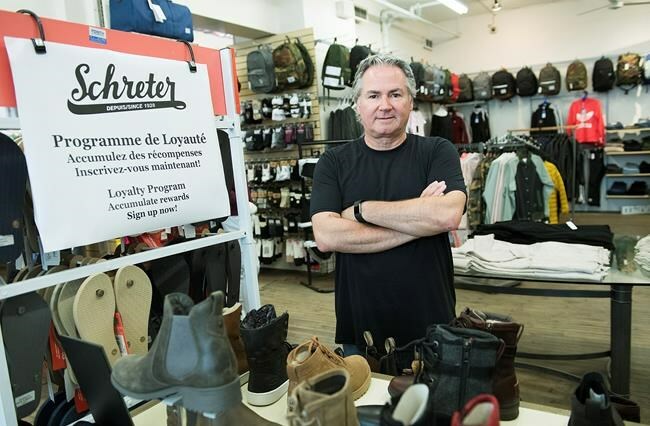 "People's education was disrupted by WW2," said Schreter, whose father, a Jew from Romania, moved to Montreal in 1948 and eventually bought the store 10 years later from his first cousin, Joseph. "They weren't educated — in that sense. They had street smarts, they had entrepreneurial skills. They managed to learn French well enough to do their business. "But, they probably could never have passed a (French) test." A French-language test, however, is what newcomers to the province will have to pass if they want to remain in Quebec, according to a controversial election promise by the party leading opinion polls. Francois Legault says his Coalition Avenir Quebec, if elected Oct. 1, will reduce annual immigration by 20 per cent and expel newcomers who fail a French-language exam after three years in the province. Legault is armed with a series of statistics he says reveal how the "integration" of immigrants in Quebec has been a "failure" under the Liberals. If Quebec's official language isn't protected from the threat of non-francophone immigration, Legault says he worries "our grandchildren won't speak French." But the Schreter family, along with leaders of many of Quebec's prominent immigrant communities, are urging Legault to be patient. First-generation immigrants might not speak French well, but their children will, they say — because their experience proves it. Moreover, these communities are asking how many of their members would be around today if their grandparents had to pass a French exam when they arrived following the Second World War. "I would not be here," said Antonio Sciascia, 71, if his parents — who came to Canada from Italy with him in 1958 — had to pass a French test to stay in the country. The head of the Quebec branch of the National Congress of Italian-Canadians said in an interview his parents never really learned the language — but he certainly did, as did his siblings and his five children. "(This policy) is an insult to immigrants," said Sciascia, a commercial lawyer. "We have proven how integrated our community has become. "We built this country — literally. The major buildings you see today, the roads, it was Italian builders." Nicholas Pagonis, president of the Hellenic Community of Greater Montreal, who opened his own accountancy company, said few Greek immigrants in the 1950s would have passed a French test. Subsequent generations, however, are mostly fluent in English, French as well as Greek, said Pagonis, 72. "I cannot imagine Montreal today, how it would look like, if the thousands of immigrants who came here in the 1950s and 1960s were thrown out after a couple of years," he said in an interview. Parti Quebecois Leader Jean-Francois Lisee in May promised to reduce the annual number of immigrants to the province, stating like Legault that the "integration" of newcomers to Quebec has been a "failure." Now, he refuses to give a specific number of annual immigrants his government would welcome. A PQ government, he says, would seek immigrants who already speak French before they arrive in Quebec. Lisee and Legault cite statistics indicating immigrants have significantly higher unemployment rates than Canadian-born citizens, and they talk about how 90 per cent of newcomers who take French-language courses fail the exam. The portrait of Quebec's immigrants depends on what stats are used, however. Quebec's statistics bureau indicates the unemployment rate for immigrants has decreased every year since 2013, from 11.3 per cent to 8.7 per cent in 2017. Quebec's overall unemployment rate is about 5.4 per cent. The 2017 auditor general report reveals that 64 per cent of 40,946 immigrants over the age of 16 who moved to Quebec in 2013 said they knew how to speak French. Moreover, immigrant children are forced under law to attend French-language school, virtually ensuring they will become francophone. Marjorie Villefranche, head of Maison D'Haiti, a well-known Haitian institution in Montreal, said Legault's immigration policy doesn't directly affect her French-speaking community, but is nonetheless "abominable." "How did we transform a population that we need — that contributes to the country — into people we don't want?" she said in an interview. Demographer Jack Jedwab says Quebecers who strongly support Legault and Lisee's immigration rhetoric and their policies largely come from parts of the province with little to no immigration. The 20,000-person town of Joliette, for instance, located in a riding held by the PQ's deputy leader 75 kilometres northeast of Montreal, welcomed a total of 75 immigrants in 2017, according to statistics he compiled from federal government data. Sorel-Tracy, a roughly 40,000-resident town northeast of Montreal, welcomed 30 immigrants in 2017. The same pattern is repeated across the province — except in Montreal, where 44,610 of the province's 52,390 immigrants who came in 2017 settled. "People who live outside Montreal are being persuaded that immigration is a threat and the fact they don't have direct contact with it makes it in some ways easy for politicians and others to tap into those anxieties," said Jedwab. Legault isn't explicitly calling immigration a "threat," however, Jedwab explained. "He talks about their 'integration' — and he allows people to deduce what they want from that," Jedwab said. "It's almost a code word."